PRIMARY JAPANESE LANGUAGE TV PACKAGES. *BASE DISH PROGRAMMING PACKAGE REQUIRED. The Japanese Pack now features Family Gekijyo, the international version of this popular Japanese channel is being created to offer general entertainment programming including, live action series, anime, documentaries and game shows. News programming to come as well. Bloomberg news and the MLB network are now also part of this package. 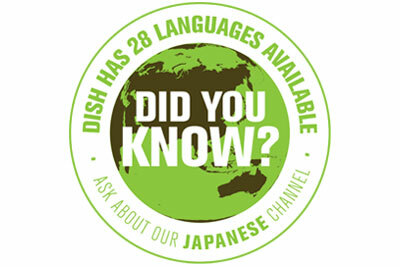 To order the Japanese Pack, contact your friendly DISH representative today. JAPANESE CHANNEL ADD-ON PACKS. *INTERNATIONAL BASE AND PRIMARY INTERNATIONAL CHANNEL PACKAGE REQUIRED.